Guatemala is an amazing country. A country filled with unbelievably kind people, astonishing beauty and inspiring ancient sights. I can hardly find the words to accurately express what an experience I had, suffice it to see it was incredible. One experience in particular which completely exceeded expectations was experiencing sunrise and sunset at the ancient Mayan city-state of Tikal. If you are lucky enough to visit Tikal, I highly recommend that you consider spending the night in the park. There are several nice options (though expensive by Guatemalan standards). I suggest The Tikal Inn as the owner Ricardo is an incredible host and tour guide. Ricardo is very knowledgeable and passionate about preservation. 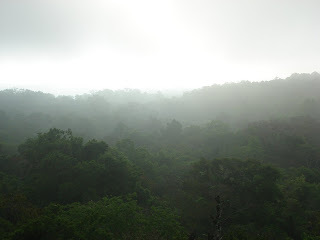 The pictures from my last post were actually taken at Tikal after sunrise. Though I am not a gifted photographer, it was easy to take artful photographs. If you have a trip to Guatemala in your future, feel free to email me for additional tips. I would love to help! This entry was posted on 3:54 PM and is filed under Sunrise at Tikal , Tikal . You can follow any responses to this entry through the RSS 2.0 feed. You can leave a response, or trackback from your own site.